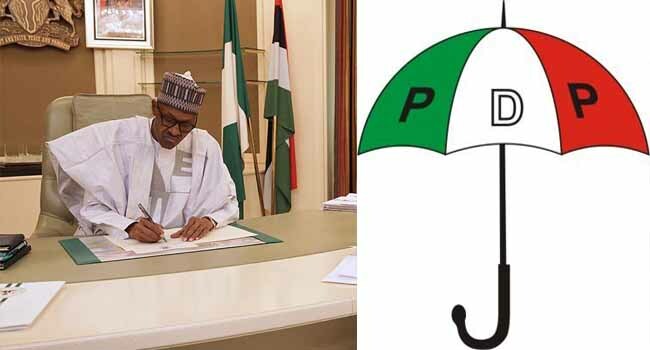 The Presidency has called on the Peoples Democratic Party (PDP) to return the funds it allegedly looted, days after the opposition party apologised to Nigerians. Senior Special Assistant to the President on Media and Publicity, Mr Garba Shehu, said this in a statement on Friday in Abuja. “This goes beyond rebranding; Nigerians are not interested in brands – they want their money back,” he said. National Chairman of the PDP, Mr Uche Secondus, had on Monday tendered an apology to Nigerians for what he called the mistakes of the party prior to the 2015 general elections. The presidential aide, however, advised the people to be cautious of the “less-than-honest” apology, noting that the point made by the Minister of Information, Lai Mohammed, was apt that there are heavy moral duties that go with apologies if the culprits want to be taken seriously. He accused the PDP of being desperate to recapture and that the party has yet to acknowledge the fact that it plundered the national economy as claimed by Vice President Yemi Osinbajo on Thursday at an event in Lagos. According to Shehu, for a party that dismissed the anti-corruption war as a political witch hunt, it is impossible to believe that its public apology comes from the bottom of the heart. “We believe that the PDP should not only apologise for the imposition of candidates, and the culture of impunity, but must also come clean and acknowledge that they participated in large-scale corruption and massive diversions of public funds to private pockets while poverty was ravaging the ordinary Nigerians,” he said. For such apology to gain acceptance, the President’s spokesman believes offenders must first of all show remorse, restore the damage caused the nation, and commit to never doing the wrong they did again. He, however, said the PDP has done nothing for anyone to take them seriously but kept accusing President Muhammadu Buhari’s administration of borrowing money. Shehu further took a swipe at the opposition for accusing the President of unevenness, inflaming ethnic and religious tensions. He noted that President Buhari has never failed in his duty as the Chief Security Officer of the nation, adding that he acts fast whenever and wherever there are incidents by ordering law-enforcement agencies to do their job and fact-finding mission to give him actionable reports.